Montebello Mom: Disney on Ice Ticket Giveaway!!! In celebration of Spring I have seven Disney on Ice Tickets to give away on Facebook! To enter share a Montebello Mom post or Montebello Mom's page on your Facebook wall and ask your friends to "like" Montebello Mom on Facebook too! 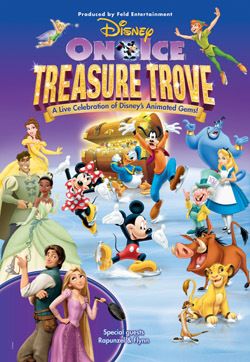 I'll randomly pick a new follower to give a set of three tickets to the Disney on Ice show. I'll message the winner and ask who recommended them to my Facebook page, whoever made the recommendation will win a set of four tickets to the show! The show is Thursday, May 2, 7:30 at the Long Beach Arena. Parking, $10, is not included. The giveaway period ends when I pick a new Facebook follower on Sunday, April 28, 2013 at 11:45pm. For Montebello Mom's giveaway policies click here.